It can be hard sometimes finding a yummy new recipe for the holidays. 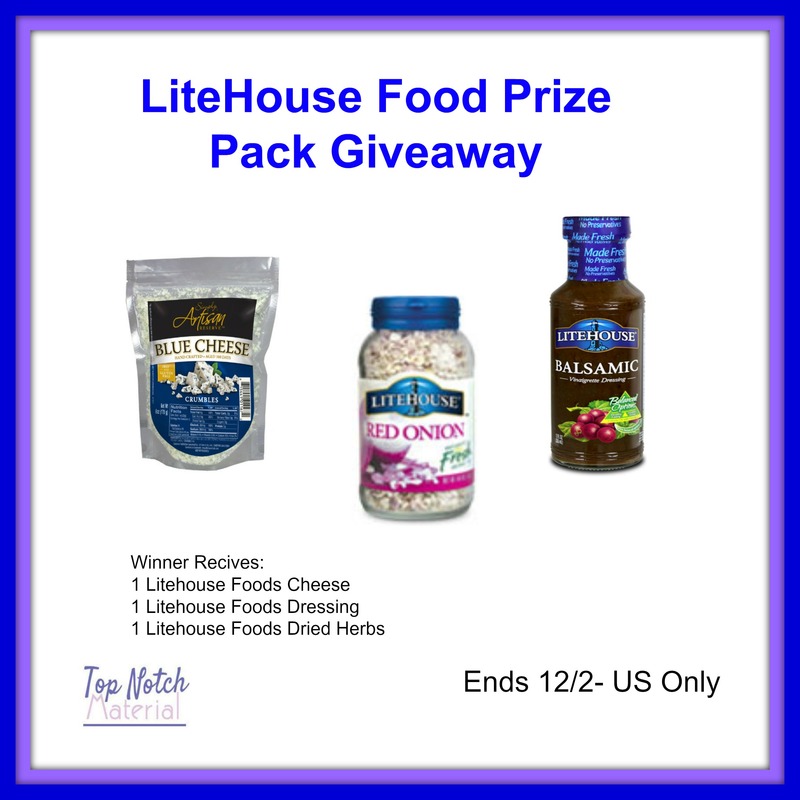 LiteHouse Food has some products that make it a little easier. The holidays are coming and so if you are like me you are looking at recipes like crazy. It’s nice to do traditional food, but new ones at the same time as well. Check out Katrina’s recipe for Strawberry and Blue Cheese Crumble Salad on her blog Top Notch Material. « Dog Adoption – Meet Jacob! I love all of the holiday dinners that include my mom’s special stuffing. It is absolutely the best! My favorite is Christmas dinner because I love the ham and potatoes. My favorite holiday meal includes turkey and dressing. turkey and dressing with all the trimmings. Kentucky ham, mashed potato’s, red eyed gravy, home made yeast rolls, Brussels sprouts that we grew. I love a fresh cooked turkey and real ham (none of that spiral sliced stuff! ), with homemade mashed potatoes, corn, stuffing, giblet gravy and pumpkin and apple pie! My favorite meal is slow cooked pot roast with mashed potatoes and a salad! My favorite holiday meal is Prime Rib, mashed potatoes, sweet potato casserole and green beans. My favorite is forth of July grilling. steak, hamburgers, hotdogs. I like to do foil packets with potato and onion seasoned on the grill also. My favorite holiday meal is Thanksgiving. There is nothing better than turkey with all the fixings. My favorite holiday meal is turkey with gravy on it,mashed potatoes with gravy,cranberry sauce and dressing and later I will have a piece of pumpkin pie with whipped cream,there are other things I have for the meal but these are my favorite parts of the meal. I love grilled ribeye steaks and homemade potato salad on any summer holiday! My favorite Holiday Meal is Turkey, Dressing, Gravy, Crescent Rolls, Cranberry Sauce, Apple and Raisin Salad, Green Peas with Mushrooms and Sweet Potatoes!! My favorite holiday meal is Thanksgiving turkey with mashed potatoes, stuffing and homemade turkey gravy. I love oven baked turkey, stuffing, and mashed potatoes and gravy. My favorite holiday meal is turkey and sweet potato souffle. I love turkey with mashed cauliflower, green beans with mushrooms, and homemade cranberry sauce! Fave holiday meal is Thanksgiving, with turkey, mashed potatoes, gravy, rolls, cranberry sauce, and all the extras. Sitting around a table with family and friends!